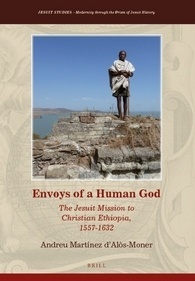 Envoy of a Human God is divided into three parts, which trace the geographical movement of the missionaries, and offers five appendices: Leading Political Figures in the Red Sea, India, and Europe, ca. 1600–1635; National and Provincial Rulers in Christian Ethiopia, 1603–1636; Jesuit Missionaries in Ethiopia, 1555–1632; Intellectual Production during the Mission, 1611–1632; and a Genealogical Chart of the Extended Ethiopian Royal Family (ca. 1550–1640).